The University of Minnesota’s McNamara Alumni Center recently unveiled its Discovery Nexus, a new center designed to spur innovation and collaboration. The purpose of the Discovery Nexus is to advance the creation, development, and commercialization of discoveries emanating from the University. In this environment, the McNamara Center wanted to use technology to create a “wow” experience to stimulate collaboration, storytelling and the pursuit of excellence. That goal led Microgigantic to NanoLumens, award-winning creators of compelling LED visualization solutions. The Discovery Nexus features collaboration stations, meeting and presentation spaces as well as an immersive 15’ by 7’ curved LED theater display designed and manufactured by NanoLumens. The idea for the curved display came from the digital content experience experts at Microgigantic. “The goal was to create a unique collaborative experience for the University of Minnesota for entrepreneurs, economic development leaders, alumni, as well as student and faculty researchers,” said Mark Bennett, CEO and Founder of Microgigantic. “We were looking specifically for an immersive technology that engaged the viewer, and when it came down to it, only NanoLumens could provide the type of all-encompassing video experience Microgigantic envisioned. They are the only player in the game making large, truly seamless, visually stunning displays that curve,” Bennett emphasized. “When Tierney Brothers introduced us to the NanoLumens solution we immediately loved the company’s unique manufacturing flexibility and ability to build curved displays with no breaks or bezels,” continued Bennett. “This NanoLumens solution allowed us to create truly immersive content for the McNamara Center. In addition to the design, Microgigantic spent 30 days over the summer producing aerial drone cinematography and interview-based storytelling that envelops the viewer. “I would love to work with NanoLumens and Tierney Brothers on future projects, because they get it,” added Bennett. 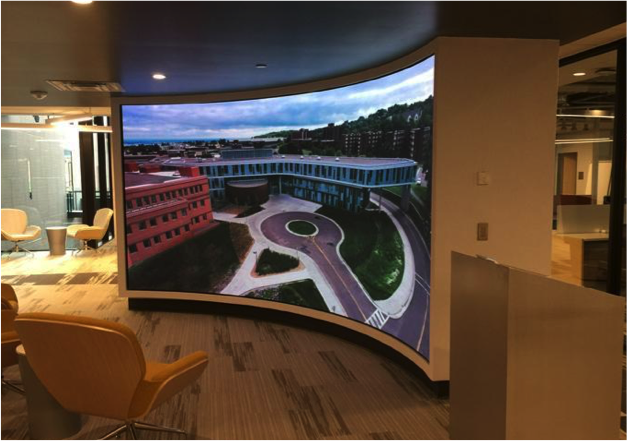 To maximize the impact of the second-floor entry space which is shared by five different University-focused departments with offices, boardrooms and multiple presentation spaces, Microgigantic envisioned a curved wall hosting the giant immersive display. These specialized needs are exactly the type of installation NanoLumens displays are made for, as they operate with less heat than competing technologies and can be serviced from the front, requiring no heavy construction or downtimes for repairs. This is thanks to the company’s revolutionary Nixel™, a roughly 6” by 10” LED panel that can combine seamlessly to create displays of any size, shape and curvature. The teams agreed on a 2.5mm pixel pitch solution to ensure that viewers sitting 12 feet from the display would not discern individual pixels and be truly enthralled by the presentation. Newer PostBigger and Better Stampede Drone Pavilion to Take Off at ISE 2018! Older Post2017 NanoLumens® Crystal Nixel™ Awards Are Now Open For Submissions!